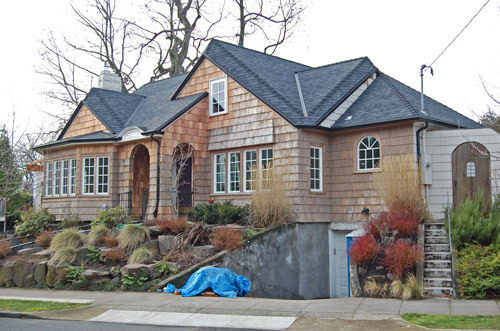 One of Portland’s most prolific homebuilders of the 1920s—Arthur J. “Matt” Matot—left his mark on the Alameda Park addition, building 20 homes here in a four-year period, including his own residence, the English cottage style home at 3817 NE 29th Ave.
During his homebuilding career, Matot (pronounced just as it looks: mah-tot) perfected what he referred to as “the Matot method” that allowed him to take his business to a higher level beyond the output of most other homebuilding contractors during those years. His business model was clearly focused on growth and production, and he thought big. In a 1928 article in The Oregonian, Matot proudly proclaimed that at the peak of business, he employed more than 80 carpenters. Arthur J. “Matt” Matot, taken in the mid 1920s. Photo courtesy of Ann Matot Shorey. Born in Buffalo, New York on February 5th, 1887, Matot moved to Portland in 1910, taking a series of jobs as salesman for construction-related suppliers. The Polk City Directory for 1913 shows Matot and his wife Alice living at 359 E 13th Street North (present-day Irvington) and working as a salesman for Pioneer Paint. In 1914-1915, he worked as salesman for Central Door & Window, a manufacturer of house parts. From 1916-1920, he sold products for Monarch Paper and Zan Brothers & Co., until 1920, when he served as secretary-treasurer and then vice president for Mill Made Construction Co. During those years, he transitioned from living in a different rental property almost every year, to owning the Alameda home at 2847 NE Hamblet. He also met and married his second wife, Ella J. Matot. 3817 NE 29th Ave. One of the early homes built by Matot, was also his residence from 1923-1924. The home suffered fire damage in the summer of 2010 and is in the process of being restored. In 1920, while living on Hamblet, the couple launched the Matot Construction Company and built one of their first houses right next door at 3817 NE 29th Ave., where they lived from 1923-1924 before moving to higher end properties in Portland’s southwest hills as the homebuilding business took off. Matot marketed himself as a builder of solid, quality, dependable homes and stood behind the work of his carpenters with a one-year written guarantee to repair or replace anything that wasn’t right, something that distinguished him among other builders during the heavy growth 1920s. He also worked fast. Compared to many other homes, the time period between Matot initiating a building permit and gaining final inspection signature was short, sometimes as little as three months. Matot’s whimsical logo featured a bar of musical notes, singing birds, and a cartoon-like English cottage. Here it appears on the front of a catalog of home designs Matot offered to prospective clients, published in Portland in the mid 1920s. The home to the left was an actual design built by Matot. Unlike homes built by Harry Phillips, Frank Read or Kenny Birkemeier, all of which have a distinctive look and their own family resemblances, Matot-built homes came in many varieties, shapes and sizes and are hard to distinguish as part of a Matot family. Most Matot homes derive from the pages of a plan book he published in the mid-1920s (which was a rebranded collection of house plans published first by Harry Boland’s Portland-based Universal Plans Service, shown above). A high percentage of those homes were small Tudor-inspired cottages, English cottage-style homes, simple bungalows, and even some Mediterranean style homes. During the rise of the company in the early 1920s, Matot’s personal interest shifted from the actual residential construction challenges to finance, and he began a branch of the business that marketed mortgages and insurance to his homebuilding customers. 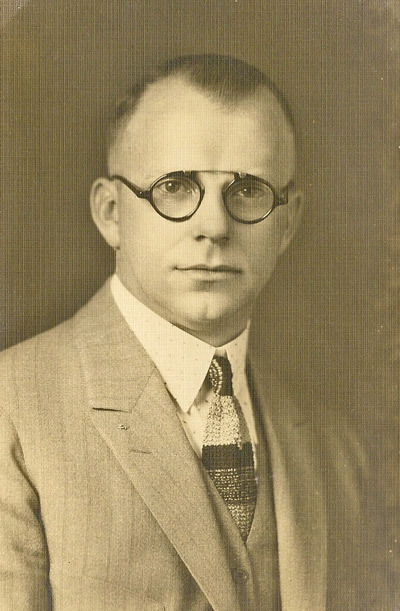 By December 1928—after successfully building more than 1,000 homes in the Portland area—Matot was ready to move full time into the financial sector. On December 2, 1928, he announced his retirement from the construction business, and the launch of his new venture, A.J. Matot Insurance and Loans. Unfortunately, on the eve of the Great Depression, the timing could not have been worse. 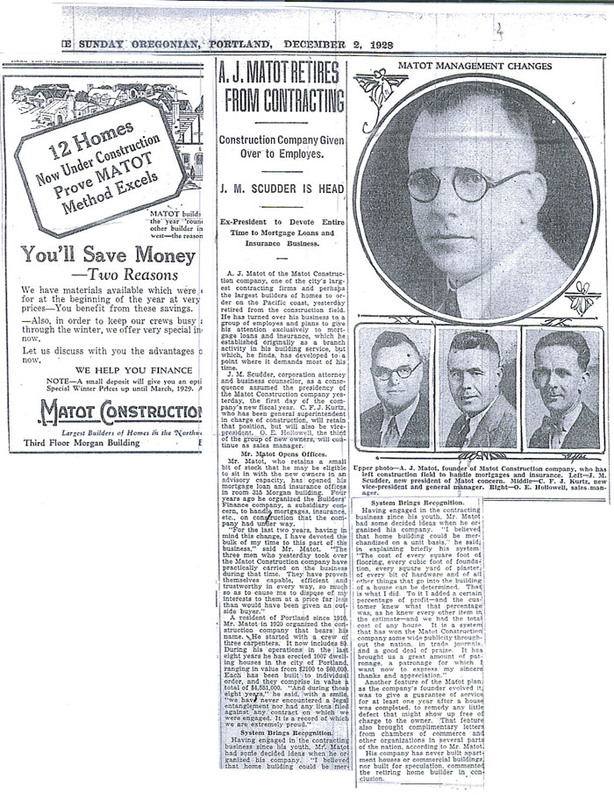 This news story, from the December 2, 1928 edition of The Oregonian, chronicled Matot’s retirement from homebuilding and launch of his mortgage and insurance business. Click the story for a larger view. While no further news stories in The Oregonian chronicle the path of his financial services business, annual listings in the Polk City Directory tell the story. By 1930, the Matots are renting an apartment in a home on Cornell Road. By 1933, the insurance and loan company no longer exists and the couple is operating an electrical appliance repair shop on Northeast Broadway. In the mid and late 1930s, the couple lived on NE 36th north of Fremont and operated an oil burner manufacturing and supply business called Pacific Heating Equipment, located at 1928 W. Burnside. In the late 1930s, Ella and Matt divorced and he moved to Petaluma, California where he married Letha Kirk, 25 years his junior, and the couple raised two daughters and a son. During these years, he worked as an executive for the Kresky Manufacturing Company, which built specialized oil burners for incubators used in the agricultural industry. In the 1950s, the family moved to Brookings for several years (where there is still a short section of road named Matot Street). In 1957, following a disabling head injury in a fall, he was divorced by his wife Letha, and moved to the San Francisco Bay area, where he lived with his daughter Lavola (from his first marriage), until his death in 1971. Daughter Ann Shorey, born into Matot’s third marriage, remembers her father as loyal, friendly, generous and a person who liked to laugh and to tell stories. “I remember as a child sitting with him while he told about his Portland days, and the homes he built,” Shorey wrote us in a recent correspondence. I live in the searle home from this catalog, but the interior is for only one family inside and it’s in Arizona. It makes me wonder how one of his designs ended up here.